Ji Ahl al-Bayt (Arabic: أهل البيت‎, Persian: اهلِ بیت‎), also Āl al-Bayt or Ahlul Bayt, is a phrase meaning, literally, "People of the House" or "Family of the House". Within the Islamic tradition, the term refers to the family of the Islamic prophet Muhammad. In Shia Islam the Ahl al-Bayt are central to Islam and interpreters of the Quran and Sunnah. Shias believe they are successors of Muhammad and consist of Muhammad, Fatimah, Ali, Hasan, and Husayn (known collectively as the Ahl al-Kisa, "people of the mantle") and the rest of the Imams from The Fourteen Infallibles. There are differing opinions on the scope and importance of Ahl al-Bayt. 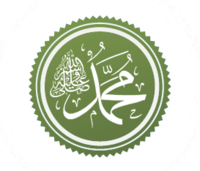 In Sunni Islam, Muhammad's household refers to Muhammad himself; his wives and daughters, including Fatimah; his cousin and son-in-law Ali; and their two sons, Hasan and Husayn. In the interpretation of certain traditions the term may also be extended to include the descendants of Muhammad's paternal uncles, Abu Talib and al-'Abbas, or according to Malik ibn Anas and Abu Hanifa, all of the Banu Hashim. In this topic, the word ahl al-bayt is treated base on the Quranic verse, in line with the commentary. To sum up, the meaning of ahl al-bayt in the Quran follows the accepted usage of the term in pre- and post-Islamic Arab society. It denotes family and blood relations as well as a noble and leading "house" of the tribe. The term Ahl signifies the members of a household of a man, including his fellow tribesmen, kin, relatives, wife or wives, children and all those who share a family background, religion, housing, city and country with him. Bayt refers to habitation and dwelling, whether tented or built. It can also be roughly translated as "household". The ahl al-bayt of a person refers to his family members and all those who live in his house. Ahl al-Bayt is the polite form of addressing the members and wife of the family. —  Sura Al-Ahzab (33), ayat 32-34. The precise definition of the term in this verse has been subject to varying interpretations. In one tradition, according to which Muhammad's companion Salman al-Farsi is included as a member, it is used to distinguish from the muhajirun (Muslim emigrants from Mecca) and ansar (Medinan converts to Islam). According to Sunni doctrine, the term includes the wives and dependants of Muhammad, as it addresses them in the preceding verse - an interpretation which is attributed to 'Abd Allah ibn 'Abbas and Ikrimah ibn Abi-Jahl, both of whom were companions of Muhammad. This is supported[improper synthesis?] by various traditions attributed to Muhammad wherein he addresses each of his wives as Ahl al-Bayt. Further members of the household, according to the Sunni perspective, include Ali, Fatimah, Hasan and Husayn, who are mentioned in the tradition of the mantle. Some versions of this tradition recognise Umm Salamah, a wife of Muhammad, as a part of the household. Thus, according to the Encyclopaedia of Islam, "the current orthodox view is based on a harmonizing opinion, according to which the term ahl al-bayt includes the ahl al-ʿabāʾ, i.e. the Prophet, ʿAlī, Fāṭima, al-Ḥasan and al-Ḥussain, together with the wives of the Prophet." According to Laura Veccia Vaglieri in Encyclopaedia of Islam "there is a story narrated in many traditions according to which Muḥammad sheltered under his cloak, in varying circumstances including the Mubahala, his grandchildren Ḥasan and Hussein, his daughter Fatimah and his son-in-law Ali; and therefore it is these five who are given the title Ahl al-Kisa or "People of the Mantle". Some have attempted to add Muḥammad's wives to the list; however, the number of the privileged is limited to these five." Other interpretations include the family of Ali, as well as the families of Muhammad's relatives such as Aqeel, Ja'far, and al-Abbas. Early Islamic jurists Malik ibn Anas and Abū Ḥanīfa included the clan of Banu Hashim within the definition, while al-Shafi'i included the whole of Banu Muttalib. In Shia thought, the household is limited to Muhammad, Fatimah, Ali, Hasan, Husayn, and their descendants (altogether known as the Ahl al-Kisa); as per their deduction from the tradition of the mantle. They interpret the change in pronoun in the Qur'anic verse as showing that only the aforementioned members constitute Ahl al-Bayt. Madelung writes that "this change of gender has inevitably contributed to the birth of various accounts of a legendary character, attaching the latter part of the verse to the five People of the Mantle." Shias view these individuals as infallible and sinless Imams and regard devotion to them as an essential part of the religion. —  Sahih Muslim, The Book Pertaining to the Merits of the Companions of the Holy Prophet (Kitab Al-Fada'il Al-Sahabah), Chapter 9: The Merits of the Family of the Prophet  The last sentence of verse 33:33. In Kitab al-Kafi, Imam Muhammad al-Baqir has narrated that there will be twelve Imams from the family of Muhammad, nine from the family of Husayn ibn Ali, the last being Al-Qa'im, and they will be spoken to by angels..
^ Hadavi Tehrani, Ayatullah Mahdi (2014). Faith and Reason. Lulu.com. ISBN 9781312616356. ^ Mc Aulliffe, Jame Dammen (2004). Encyclopedia of the Qur'an, volume four P-Sh. Brill. ISBN 978-9004123557. ^ a b Böwering, Gerhard; Patricia Crone; Wadad Kadi; Mahan Mirza; Muhammad Qasim Zaman; Devin J. Stewart (11 November 2012). The Princeton Encyclopedia of Islamic Political Thought. Princeton University Press. ISBN 9780691134840. The term ahl al-bayt (the people of the house) is used in the Qur'an as a term of respect for wives, referring to Abraham's wife Sarah (Q. 11:73), for example, and to the Prophet Muhammad's wives, who are declared to be purified by divine act: "God's wish is to remove uncleanness from you" (Q. 33:32-33). ^ "The Ahlul Bayt". Al-Islam.org. Archived from the original on 31 July 2012. Retrieved 14 August 2012. ^ "The Quran Speaks About Ahlul Bayt". ^ "ĀL-E ʿABĀ". Archived from the original on 18 October 2014. Retrieved 16 September 2014. ^ "Al-Quran Tafsir - Tafsir Ibn Kathir- Surah33.Al-Ahzab, Ayaat32To34 - Alim". alim.org. Archived from the original on 21 March 2018. Retrieved 20 March 2018. ^ Tabari, Muhammad bin Jarir (1991). Jame al-Bayan Fi Tafsir al-Quran. 22. Beyrut: Dar al-Ma'rifah. p. 6. ^ "Who Are Ahlul-Bayt? Part 1". Al-Islam.org. 12 November 2013. Archived from the original on 29 December 2014. Retrieved 10 January 2015. ^ Al-Kulayni, Abu Ja’far Muhammad ibn Ya’qub (2015). Kitab al-Kafi. South Huntington, NY: The Islamic Seminary Inc. ISBN 9780991430864. ^ al-Munajjid, Shaykh Muhammad. "What is the virtue of Ahl al-Bayt". islamqa.info. Archived from the original on 25 December 2014. Retrieved 15 November 2014. ^ al-Munajjid, Shaykh Muhammad. "Ruling on giving zakaah to Ahl al-Bayt". islamqa.info. Archived from the original on 25 December 2014. Retrieved 15 November 2014. ^ Ahl al-Bayt, Encyclopedia of Islam and the Muslim world. ^ "History of Khalifa Ali bin Abu Talib - Ali, The Father of Sufism - Section 1 - Islamic History - Alim". alim.org. Archived from the original on 13 November 2013. Retrieved 20 March 2018. Tahir-ul-Qadri, Muhammad (2006). Virtues of Sayyedah Fatimah. Minhaj-ul-Quran Publications. ISBN 978-969-32-0225-0. Tritton, A.S; Goldziher, I.; Arendonk, C. van. "Ahl al-Bayt". In P.J. Bearman; Th. Bianquis; C.E. Bosworth; E. van Donzel; W.P. Heinrichs. Encyclopaedia of Islam Online. Brill Academic Publishers. ISSN 1573-3912. This page was last edited on 9 April 2019, at 13:43 (UTC).